15 · 1h 56m · 2019. Anna Diop · Cali Sheldon · Elisabeth Moss · Evan Alex · Lupita Nyong’o · Noelle Sheldon · Shadadi Wright Joseph · Tim Heidecker · Winston Duke · Yahya Abdul-Matten II. strong language · threat · violence. Showing us he was more than a comedian with his dark and twisted debut Get Out (2017), Jordan Peele returns for his follow-up movie. Us is another psychological horror film and follows a family who get more than they bargained for when a vacation descends into chaos. Lupita Nyoung'o and Winston Duke star as Adelaide and Gabriel Wilson. Along with their children Zora (Shahadi Wright Joseph) and Jason (Evan Alex), they go to their family beach home for a much needed holiday. Escaping their busy lives proves difficult however when intruders break in with nefarious designs. Even more disturbing is that these trespassers look exactly like them. 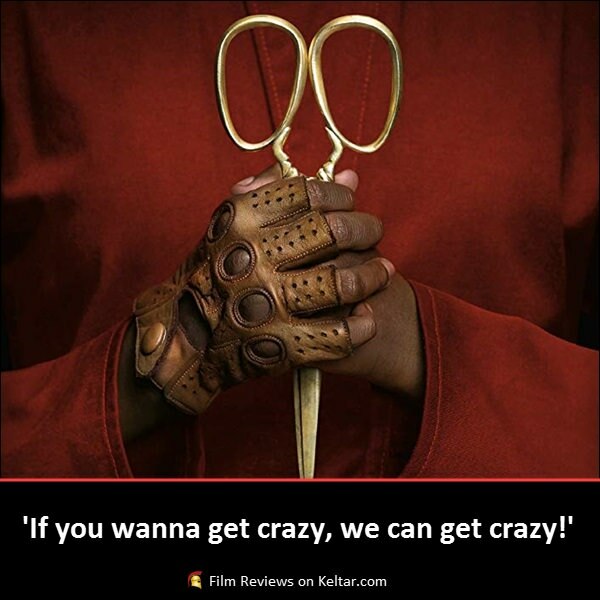 Proving Get Out was no fluke, Peele delivers another stand-out movie. He continues to show a keen understanding of the horror genre, and how to best get under the audiences’ skin. Without having to resort to cheap jump scares, he does something different with the home invasion concept. Providing a fresh take on this popular sub-genre, he offers something complex and more thought-provoking. 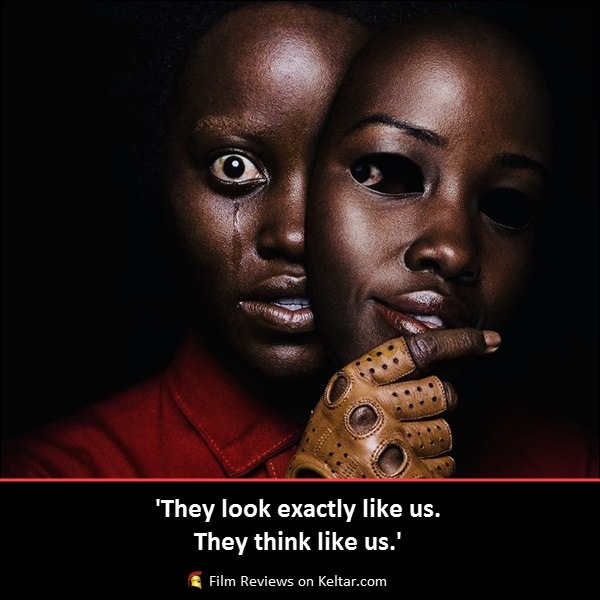 The story itself is really intriguing, and Peele has cleverly made sure that nothing has been majorly spoiled in any of the movie's marketing. There's a mystery element to it which is really fascinating. You'll be utterly engrossed as you try to work out what's going on and how it will all play out. On top of that, there's a lot of subtext as well, and Peele clearly has something to say about the state of society. Yet it's subtly done, and it never overwhelms the main movie-going experience. Likewise, it's impeccably paced. Taking his time, Peele introduces the Wilson's first, giving us a solid grasp of who they are before anything else happens. So when we do come to the main invasion, we already care what bestows them. In the lead-up to that, he also expertly lifts the tension, and gradually builds unease within the viewer. Not as much as his debut, but there's also a faint comedic element added to Us. Inserted at just the right times and never overplayed, it helps break the tension enough to keep it entertaining. Peele also skilfully balances that aspect with the main horror one, never losing the impact of the fear he's supposed to be inducing. When it does come to the scare factor; it's the atmosphere, cinematography and score that are the focus. Jump scares are kept to the minimum, and Peele does a great job of keeping us on-edge through the visuals alone. Speaking of which, combined with some splendid editing and framing, this is a good looking movie. Freaky imagery is put on the screen that's able to keep everything suspenseful. What’s more, the doppelgängers are creepily realised. Just the way they're presented and designed is enough to get you squirming in your seats. Animalistic in their movements and behaviour, they make for some unnerving antagonists to go up against. There's extra work for the actors to do in portraying the doppelgängers, and they deliver with strong performances all round. Saying that, special mention has to go to Nyoung'o, who has to do the bulk of the work. She brings a powerful range of emotions as she defends her family, while also contending with a past trauma. All that she's going through you see it right on her face, keeping you engaged all the way through. As the main doppelgänger, she's apt in showing the distinction between her two characters. You really will see them as two different people. The rest of the Wilson's are equally good in their dual roles. Duke drops the swagger from Black Panther (2018) and is convincing in playing that typical embarrassing dad. Getting some of the funnier moments, he holds his own alongside Nyoung'o's meatier role and arc. Joseph and Alex are brilliant young actors and are just as superb as the Wilson children. Their evil versions are very unsettling, and they pour themselves into that psychopathic demeanour a little too easily for comfort. Us is another fantastic horror film from Peele. Slowly proving himself one of Hollywood's most versatile film makers, it will be exciting to see what he does next. With excellent writing, skilled direction, and Nyoung'o's riveting performance, this is easily an early contender for the best horror film of 2019. The Wilson family take a vacation to their beach home in Santa Cruz but find themselves terrorized by doppelgängers who look like them. Review by David Axcell. This article is copyright owned by Keltar Limited. All rights reserved. Plagiarism or unauthorised copying is not permitted. All other copyrights remain the property of their respective owners. Posters, images and quotes credit: Us (2019) production and distribution companies. Trailer credit: Universal Pictures – YouTube.